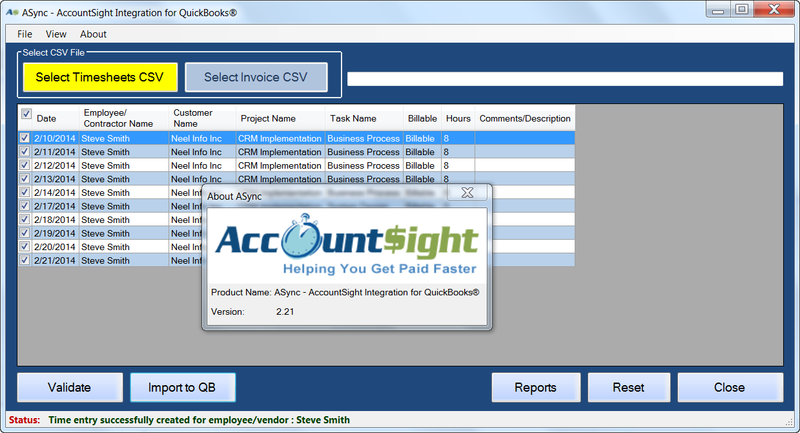 AccountSight Software is excited to announce the QuickBooks integration to their latest cloud-based online application version 2.21, a simple and easy to use time, expense and invoicing solution for customers worldwide. Integrating AccountSight time tracking software with QuickBooks solves the problem of transferring time tracking data to QuickBooks accounting software. Users can manage all their weekly timesheets and project invoices in AccountSight and then easily and quickly export the data into QuickBooks to perform accounting operations. Save time and money by eliminating duplicate time entry in QuickBooks. Reduce costly data errors by not having to enter time manually in QuickBooks. Convenient time entry for the user has workflow notifications and reminders. The manager approval process ensures that employee or contractor time is entered accurately. Utilize the user-friendly time entry features seamlessly integrated with accounting and payroll. Sign up for a free 30 day trial to try out the new QuickBooks integration feature. Give it a try now at AccountSight. Its flagship product is the easy to use online time tracking, expense recording and invoicing software ideal for small to mid-size businesses, consultants, independent professionals and freelancers. It is full of productivity-driven features that are conveniently available to users through a very helpful interface. The many customer benefits and hassle-free user experience make AccountSight unique. For more information, please visit AccountSight.